These are ROM images for use with the emulator. Includes Bally/Astrocade cartridge ROM images and the three available On-Board ROM files. The included files are: here. Two versions of each ROM file are included in two different directories. One directory holds the ROMs with TOSEC filenames. The other directory holds the ROMs with names required for MAME. Everything that was officially released is here (plus far more)! Note that some of these ROMs require a real Astrocade to run and will not run with the emulator. Others will even require additional RAM for the real Astrocade. A machine language monitor program that uses an overlay. It is unknown if this program is complete. No documentation exists for this program. This prototype of the original Bally BASIC was created by Richard Degler in March of 2010 using the Bally BASIC Demo cartridge. Included in this archive is the original posting explaining the differences and what he did to create this prototype. Black Box (Game Description and Rules) on Wikipedia. You can view some quick documentation here. By MCM Design (Michael Matte). 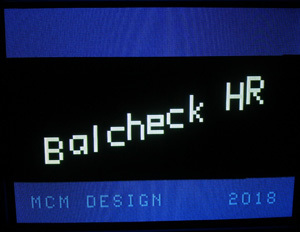 This is the 8K ROM image for the software for the BalCheckHR unit. This hardware allows experienced electronics users to diagnose many problems with a Bally Arcade/Astrocade game console. This device has many improvements over the original BalCheckHR hardware, including special routines to test Astrocade units that have been modified to use high-res mode. On the BalCheckHR hardware, this is bank 0 of the 32K ROM on the BalCheck hardware. This programs requires a keypad overlay, which is described in the user manual. There are also two additional versions of Yesterday and one additional version of I Feel Fine. This is a pretty complicated release, so there is a file included that goes into detail about the songs. An early version of the more popular and standard Blue Ram BASIC 1.1 programming language. This cartridge tester is used to test newly-created Bally/Astrocade cartridges. This cartridge requires expanded memory to run. For full details about this program read here. A BASIC program converted by Mike White to run from cartridge. An updated BASIC featuring 32 colors. This cartridge was never released (this ROM is a fixed version of a prototype). This prototype didn't load programs properly, but this has been fixed by Richard Degler. Also, no manual was available, but Richard disassembled the program's binary and created documentation. It can be downloaded here. The link to the fixed version of Color BASIC includes extra files, including a full disassembly of the source code among many other extras. The original dump of this game, the one with the error when trying to use :INPUT, is still available for archival purposes. It is strongly recommended not to use this ROM, but if you want to try it out, then you can get it here. A WAV version of the unfixed ROM, with the same reservations, for use on RAM expanded Astrocades is available here. A prototype of the unreleased Conan the Barbarian cartridge. A prototype of the eventually released Cosmic Raiders cartridge. An incomplete machine language game written by someone that corresponded with Bob Fabris (the editor and publisher of the Arcadian newsletter). The player in this D&D-type game can wander around a randomly created maze, but there are no monsters. This is an interesting piece of what might have become something interesting. As it stands, it is little more than a programming exercise. In January 2008, Lance F. Squire converted the Goldfish Demo to run as a cartridge. This is the finished conversion (version 1.4); it runs perfectly. Designed by Brett Bilbrey and released into the public domain in 2001 by Brett Bilbrey, Mike Toth and Marian Nalepa (Spectre Systems). "I.C.B.M. Attack" requires a special hand controller to play on real hardware- it can NOT be played without it." While the emulator does not support this controller directly, it can be configured to play it by following the instructions: Playing ICBM Attack Using the MESS Astrocade Emulator. 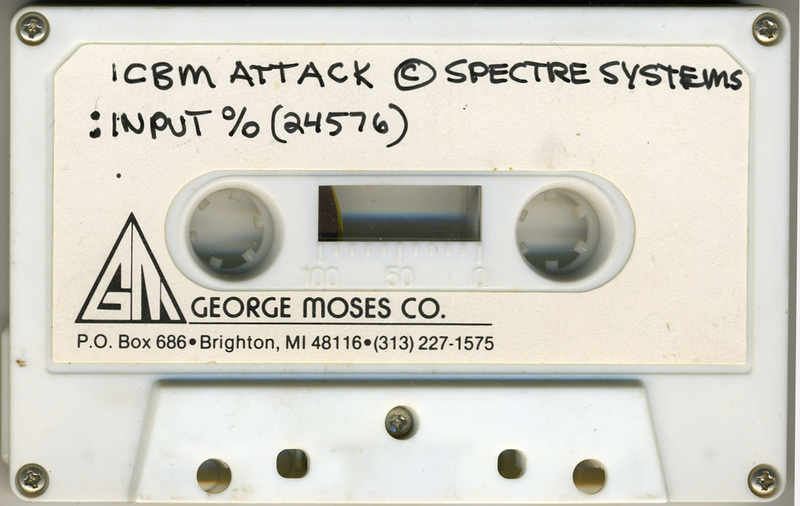 Paul Thacker found a prototype version of ICBM Attack on tape in the Bob Fabris collection. Unlike the previous versions found that run in BASIC, this one can only be loaded as a cartridge image into a RAM expansion. In addition to the tape recording, Paul went ahead and processed this into a binary file. This version is playable on a real system, and it also works fine in MESS. The title screen on this version is a little garbled. Paul was initially afraid that it hadn't digitally processed correctly, but there is a second recording on the same tape, and it processed into exactly the same file. While the MESS emulator does not support this controller directly, it can be configured to play it by following the instructions: Playing ICBM Attack Using the MESS Astrocade Emulator. Unlike the released version of "ICBM Attack," which needs to have a soft reset performed after turning on on the system, this prototype version does not require that to be done. A 2000-baud digitally archived tape version of this ROM image can be loaded into a RAM expansion. This version can be downloaded here. For a look at the casette tape that contained this prototype, check here. Demonstrates how to put graphics on the menu screen. This program is VERY short, but I've upload all 4K- almost all of it is empty space. Designed by Michael White. Music Decomposer changes MUSIC STRINGS from cartridge format to AstroBASIC format. Important Note: This BASIC program is written for Blue Ram BASIC 1.1. The Music Decomposer binary works as a regular BASIC program, but it does NOT start as a cartridge. The program was on an EPROM so that it didn't have to be reloaded from tape. Check out the included, brief, instructions on how to use this program. A printout of this program is available here. This includes the Z80 source code file, as well as a pre-assembled version of the binary file that can be run in MESS. A program to display the Namco font on a Bally / Astrocade. Only 24 characters can be typed from the key-pad (mostly numbers and symbols.) So first it prints ALL the letters double-sized, followed by some of the un-reachable symbols. The six (blue) letters in my name were stored in only four characters! This ROM was dumped by Paul Thacker from his very early Bally Arcade console. He comments about his system, "The system itself definitely seems early as well. In addition to the different dust cover label, the red reset button, and the silver eject button, the casing is missing most of the explanatory text such as On/Off and 3/4 for the channel." Richard Degler took a look at this ROM and has some comments, "Differences from the "3159" BIOS are the SYSTEM Routine Jump Table (since the routines are shifted), and the location of text strings and the Font (which is why to use the Dope Vector). The date starts at 3604 and is the leftover "977" of WHITE BIOS. After that the built-in games have few changes, except Gunfight plays to 9999 (like the 1978 version) and has one color changed. CHECKSUMs #1 and 2, as well as FUDGE4 are also different, so the un-modified BAL-CHECK should work fine on this machine as it is." A program that puts a nice 66-color display on the screen. Note that the EPROM was noted with a sticker as "Ver. 2." No earlier version of this program have been found. This archive also includes "Version 2A" with improvements by Richard Degler. Version 2A now SCROLLs. This is a slight improvement that Richard made on his way to version 3 of the program. An early version of Solor Conqueror. This cartridge was released into the public domain in 2001 by Brett Bilbrey, Mike Toth and Marian Nalepa (Spectre Systems). Written by Brett Bilbrey. An Alternative Engineering prototype Vipersoft BASIC cartridge that contained a tape-interface. This is unusual because this BASIC was eventually released, but on tape. This version doesn't seem to be fully functional. I just uploaded to the file area a proof of concept of what I mentioned before, I replaced the program from the Bally BASIC Demo with another one, "Words Of Wisdom by W&W", from one of the damaged recordings Adam and Paul sent me for recovery. The program is appropriate for this, as it seems to run continuously without any user input. The file is just a cartridge image inside a Zip file, so, if you wish to check it out, just load it with MESS (no special setup required). This is a modified version of Amazing Maze, VideoCade #5001 (in the Strategy series) for the Bally / Astrocade. This modified version shows what the computer is thinking about instead of just the scratchpad area where it is working out the mazes. Now that you can see the maze being generated I've counted several times how many generations of a route it takes for the computer to get one that works. On the "Hard" level I've counted as high as 68 failed routes and as low as four. I did this about six times and the average seemed to be about fifty or so. So perhaps that generation of a good route after four times was a fluke. Give this program a try-- it's pretty neat to know what is going on behind-the-scenes of the maze while it is being created.